The Parks, Recreation & Community Services Department is responsible for administering and coordinating the city´s Active Adult Center, which provides ongoing programs and services, as well as special activities, for individuals 55 years of age or older. 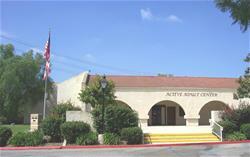 The Active Adult Center is managed by one full-time Senior Center Supervisor. The center publishes a monthly newsletter featuring a calendar of events and activities. Additionally, the center provides both onsite congregate and home-delivered meals that are served weekdays at the Active Adult Center. The city receives a grant from the Ventura County Area Agency on Aging to provide this program. In previous years, this program was operated by the County of Ventura. Interested in Pickleball? Join the new AAC Pickleball class! All levels are invited to participate in this new class 10:30 a.m. on Tuesdays at Tierra Rejada Park. There is no lesson fee, but each player must purchase a small pack of balls to be used during class. All participants are encouraged to bring a paddle, however, limited paddles will be available for use. Please call the AAC front desk at 805-517-6261 with any questions. Don’t miss out on our Bingo Bash fundraiser! Help raise money for the Moorpark Active Adult Center while having lots of fun and trying your luck at hundreds of dollars cash prizes! Your pre-paid ticket ($20 pre-sale, $25 at the door) will include all games, a delicious all-you-can-eat dessert bar, coffee, and tea. Additional game packets will be made available the day of the event. Your paid attendance will also make you eligible for numerous door prizes. Players must be 18 years of age or older to play. The event is co-sponsored by the American Legion Post 502. Tickets on-sale NOW at the AAC. For more information, call 517-6261. Time: 8 a.m. - 12 p.m. by appt.